March is the month of Saint Patrick and all Irish make arrangements to celebrate Saint Patrick's Day enjoying the festivity with the traditional Irish food, music and drinks. Corned beef Cabbage and Potatoes is the traditional dish at Saint Patricks Day since the 1800s; when first Irish-American substituted bacon for corned beef which was more affordable. Irish parades and events are held through all the United States and people also celebrate the Irish culture at restaurants and bars. In Ireland, it is a national holiday, and people in countries like England, Wales and Scotland, with Irish ancestry, celebrate in pubs and local bars. Irish cuisine is based on products such as pork, seafood, vegetables, and potatoes. Although, potato is not originally from Ireland (as it was introduced in Ireland in the 16th century) it became a staple food for Irish people. Below is a list of Irish food and dishes you will want to enjoy at Saint Patrick's Day. Irish breakfast is served with sausage, black and white pudding, bacon and fried eggs. 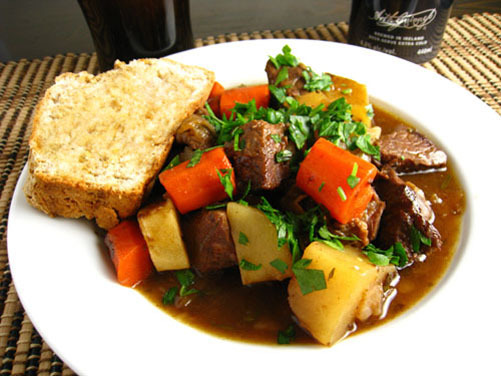 Irish stew made with lamb or mutton meat, potatoes, onions, carrots, and parsley. Irish bacon cabbage and Potatoes the original Irish recipe; Corned beef has substituted the Irish bacon for Irish-Americans. Shepherds pie, minced lamb or beef mixed with vegetables and covered with mashed potatoes. Irish Coffee is a hot drink made with coffee, whiskey, and topped with whipped cream. Happy Saint Patrick's Day 2018!